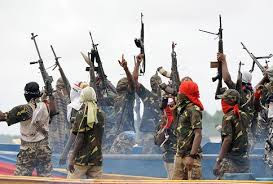 In a statement signed by Mudoch Agbinibo, the group’s spokesperson, the dreaded Niger Delta Avengers have issued what it called ‘last warning’ to seven state governors to free pro-Biafran activists being held in police and military custodies in their states. The new militant group which has vowed to bring Nigeria’s oil production to zero, gave 72 hours to the governors to free Biafran agitators. According to the group’s spokesperson, some of the governors threatened by the group are Okezie Ikpeazu of Abia, Willie Obiano of Anambra, Seriake Dickson of Bayelsa, Ifeanyi Okowaof Delta, Dave Umahi of Ebonyi, Ifeanyi Ugwuanyi of Enugu, and Rochas Okorocha of Imo State. “We request the immediate release of all pro-Biafrans activist held in your various Police/Military Custody, you are hereby given 72 hours to release them or risk your convoys, police station, military base and government offices being attacked.“We are not negotiating with anybody and nobody is representing us. In 48 hours we will release a video clip showing our arms and the targeted areas.“All strike team already in position awaiting command. We are ready for war and we have nothing to lose!! !,” the group stated.